Best of luck, and great work so far! Add fan to the list of things we need to Rep! Nice to see some examples of self-repair/self-organ-replacement going on. Seems like a natural step between the inert, inorganic collection of parts and a "living" reprap. nophead: We need a fan anyway for cooling the workpiece. 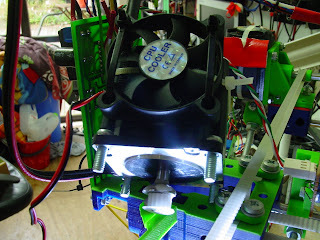 The stepper cooling fan should go away when we move to DC servos. Fans can also be salvaged from all the junk electronics out there, so they are pretty much free. It'll be good to get rid of them eventually though. 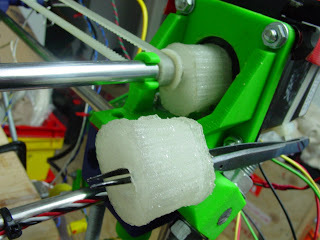 This is pretty neat, have u managed to print any other parts such as corner brackets?